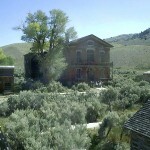 What is a ghost town without haunts? According to reports, this one has quite a few. Dorothy, a ghost who wears a blue gown, is said to have drowned in nearby Grasshopper Creek. Also reported are a whole gang of outlaw ghosts, all of whom were once executed in the town. And thanks to past illness epidemics which claimed the lives of several infants, some folks say you can hear the ghostly wails of crying babies on the breezes. We have visited this place several times and have not been let down by the experiences. On one occasion a lady said that she felt a spirit walk right through her. Well, we kind of made fun of her. In this very active town don’t do that. We ended up getting locked in that house. I used all of my body weight trying to get the door open. We left out of the back door that we noticed was open. When we came around the front door was open. On our last visit we were in a house and there was a photographer in there. We were quiet and respectful. We heard what sounded like furniture being moved upstairs. We rounded a corner to see her sitting on the floor to get a good shot with her camera. I said oh I thought that was you moving furniture. She said “no” how do you get upstairs? I said I don’t know. When we came out of the house we noticed that there was not an upstairs. I physically saw a hand touch my daughter’s shoulder in the doctor’s house. I left quickly. Love this place. The first time I went to Bannack I saw an elk walking in the creek as you first drive in, I thought it would be a cool picture so my husband turned into the camp ground and drove to the end. I got out of the car and hurried towards a gap in the trees/bushes near the creek, the water was high and I was a little nervous getting close, I tried to look past the bushes when I heard a female voice say “I wouldn’t go any farther if I was you”. I stopped and looked around to see who said it and there was no one there. I later read on line about Dorothy Dunn and that I was close to where she had drowned. I think Dorothy was warning me.